You really can’t get any simpler with this recipe. You can quickly make these shrimp and serve as an appetizer, add to a Summer salad, or as the main protein for a quick dinner. I don’t peel or devein the shrimp for this recipe. I find that the shrimp are more tender when grilled in the shell and I like the flavor. The key to this recipe is using fresh wild caught shrimp. 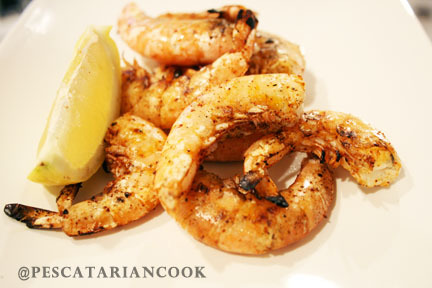 I take my fresh shrimp, throw them in a bowl and top it them with this easy marinade recipe. I let this marinate for 15 min. and then throw them on a grill (medium heat) and grill quickly for 3-4 min. That’s it!! Now get ready to get your fingers dirty and make your mouth happy!